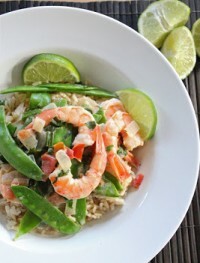 Do you love shrimp scampi? 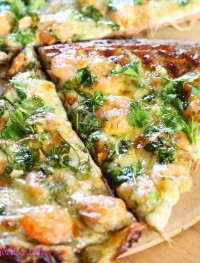 If you do you will love this shrimp scampi pizza. It is the total indulgence. The best of both worlds. 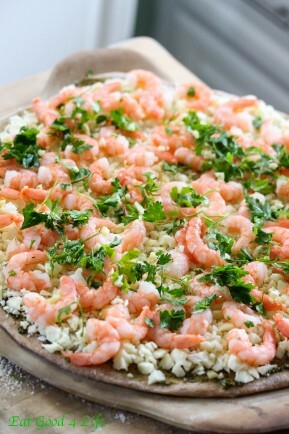 I have made this shrimp scampi pizza a couple of times and it is always a success. 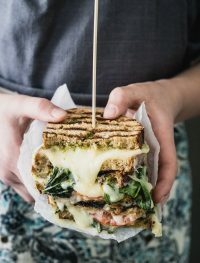 Not only it is super delicious but it is not that hard to put together. What I do most of the time now is buy store bought whole wheat pizza dough. This not only saves me time, but I think it saves me a lot of money because when I make my own pizza dough I use 4 cups of whole wheat flour and the flour I think costs me more than buying the pizza dough already made. Don’t get me wrong, I will still make my own pizza dough, but sometimes it is nice to just go to the store and buy it. 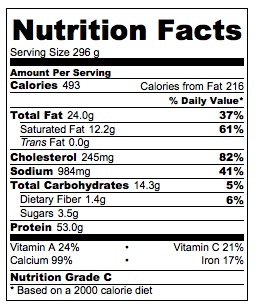 After all, the ingredients are still good. If you still want to make your own pizza dough here is the recipe I normally use. Friday night is pizza night at my house. I always make two pizzas because one just won’t cut it! One pizza I will keep plain for the kids and with the other one I will get creative, like in this case. I always use my pizza stones. I really truly love them. They make the pizza crust cook evenly and makes the dough crunchy like we like it. Tip: Make sure when you spread the pesto sauce over the dough you don’t spread it too close to the edge. I did and the pesto dripped over and my oven got dirty and super smoky. Make sure you spread the pesto sauce at least one inch away from the edge of the pizza dough so this doesn’t happen to you too! 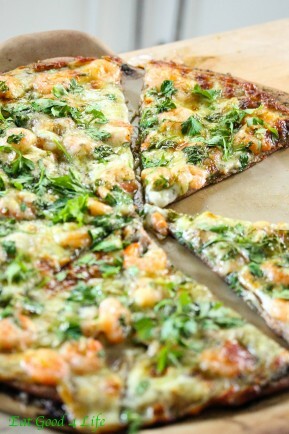 This shrimp scampi pizza is truly sensational. I hope you get to make it. If you like garlic, parsley, pesto and shrimp you will love this pizza. 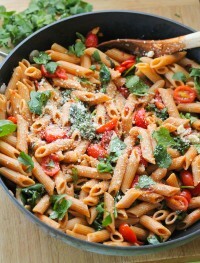 I added extra parsley and extra garlic too. I can never have to too much of either one. On a floured surface, with a rolling pin, roll out the pizza dough. Transfer it onto the pizza stone and with the help of a pizza roller make sure the dough extends all the way to the edge of the baking stone. For this pizza I used already cooked frozen medium shrimp but you can use uncooked if you like. 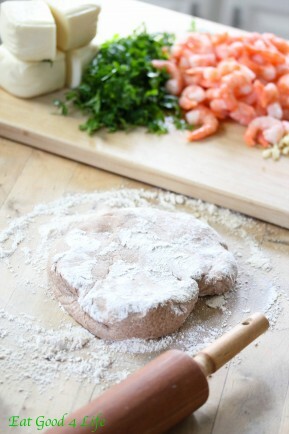 Just make sure the shrimp is well drained and squeezed otherwise the pizza will become soggy. Once the pizza is done sprinkle some more fresh parsley and garlic if you like. I do. 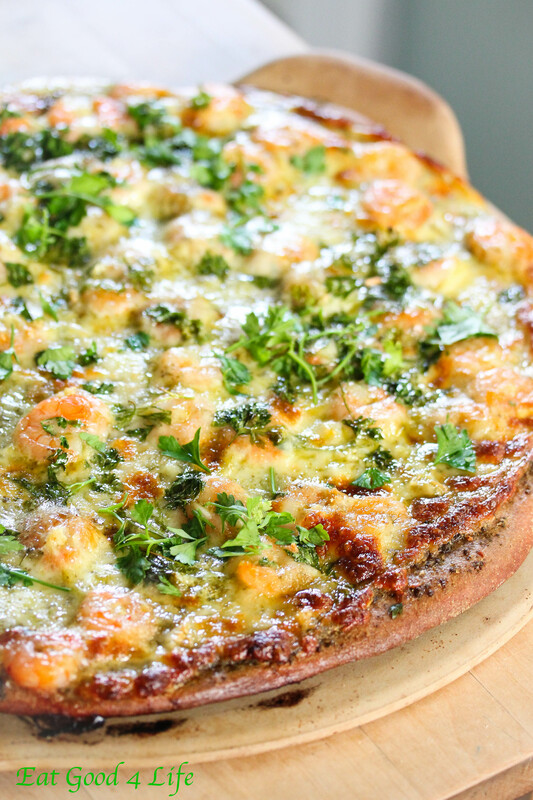 This shrimp scampi pizza is out of this world. I hope you get to try it soon!! With a pizza roller or rolling pin, I actually use both, roll out your pizza dough all the way to the edge of your pizza stone or prefer pizza baking pan. 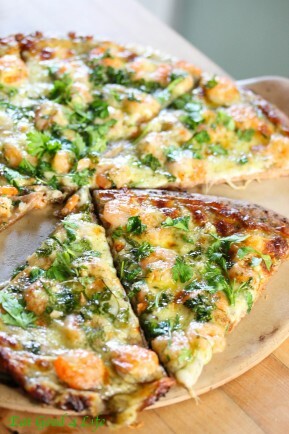 Spread about 2-3 tablespoons of the pesto sauce over the pizza followed by the mozzarella cheese. Arranged the shrimp and onions over the top followed by the garlic and half the parsley. Bake for 15-20 minutes or until the cheese starts to brown a bit and the top in bubbling. I baked mine for about 18 minutes. Let the pizza sit for 5 minutes. 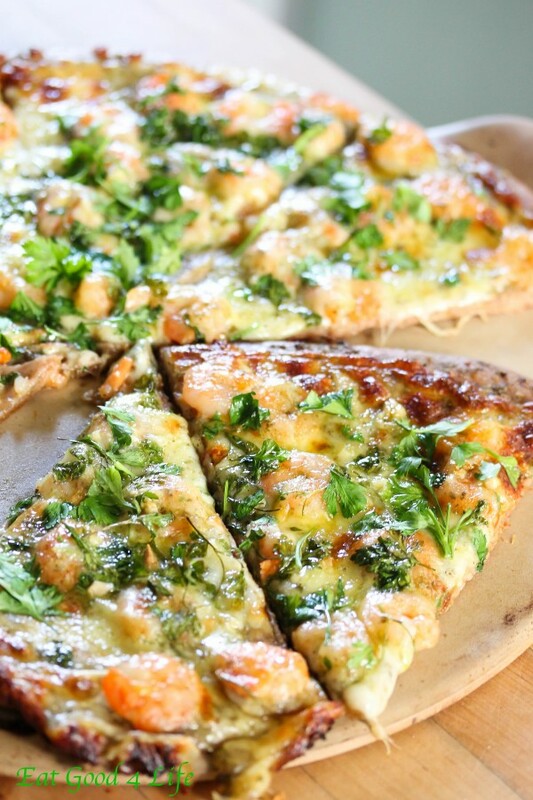 Sprinkle the remaining parsley over the pizza and serve.